03/29/19 - Effectiveness of MCI® Surface Protection System in Krk Bridge Preservation Project! 03/27/19 - Case Histories Highlight Success of Cortec® Water-Based Rust Preventatives for Nearly Two Decades! 03/11/19 - Preserving the Environment with Premium Corrosion Inhibiting Papers! 02/04/19 - First Croatian Bioplastics and Anticorrosion Films Plant Launches New Brochure! 01/28/19 - Cortec's 329 D ES in Easy Spray Formula: Powerfull, Long-Term Corrosion Protection of Your Assets! 01/22/19 - Cortec® Introduces the Next Generation of Corrosion Inhibiting Fuel Additives! 01/15/19 - New Cortec® Additive Enhances Corrosion Protection of Water-Based Coatings Systems! 11/02/18 - EcoCortec®, Manufacturer of VpCI® Anticorrosion Packaging Opened Second Plant in Croatia! 07/10/18 - Cortec® Group Controls Largest VCI Market Share! 06/18/18 - Croatian EcoCortec® Plant Receives Best Supplier Award! 06/08/18 - Cortec® VpCI® Additives Brochure Offers Customized Corrosion Protection for Metalworking and Hydraulic Fluids! 05/10/18 - New BioCortec® Brochure Underscores Cortec's Commitment to Providing Sustainable Corrosion Solutions! 05/07/18 - Cortec's Solutions Rehabilitate Vulnerable Structures: MCI®: Technology Used to Restore Historical Buildings in Europe! 04/11/18 - Cortec® Receives CE Approval for Migratory Corrosion Inhibitors (MCI®) Products for the European Market! 03/20/18 - Cortec® Offers Synergistic Corrosion Inhibiting and Desiccant Action! 03/15/18 - Cortec® Develops Environmentally Conscious Biobased Grease with Superior Corrosion Protection for Machines and Bearings! 02/23/18 - CorrVerter MCI&REG; Technology Utilized to Preserve War - Destructed Monument! 02/23/18 - Cortec&REG; VpCI&REG;-649 BD Fights Corrosion, Scale, and Odor in Closed Loop Systems, Pipelines, Tanks, and More! 02/08/18 - Cortec® Corporation Appoints Macroplastic as Exclusive Regional Licensee for Anti-Corrosion Films and Bags! 01/17/18 - EcoCortec®- Partner in European BIOCOMPACK Project - Promoting Green Environmental Sustainable Packaging! 01/11/18 - Cortec® Corporation Helps Contractors Put Rebar Rust to Rest! 01/03/18 - Cortec® Releases Unique VpCI® Additives Brochure for Fuels, Crude Oil, and Natural Gas! 12/19/17 - Use of Cortec® MCI®-2005 Admixture Raises Seawall Service Life Prediction to 150+ Years! 12/13/17 - Time, Labor and Cost Savings with Cortec's Multifunctional, Safe Solutions for Export Packaging! 11/20/17 - Cortec® Introduces EcoShield® Super Barrier Paper and Linerboard: An Environmentally Friendly Replacement for Polycoated and Waxed Papers! 11/07/17 - State-of-the-Art Perforator Equipment Expands Cortec® VpCI® Paper Perf Capabilities to 50 Inches! 10/31/17 - EcoCortec®- Biggest European Producer of Anticorrosion Films and Bags is Building a New Facility! 10/26/17 - Vapor-Phase Protection against AST Soil-Side Corrosion-Now Faster Than Ever with CorroLogic® Nano VpCI® Powder! 10/17/17 - CE Certification Opens EU Market to Six Cortec&REG; MCI® Concrete Protection Products! 10/11/17 - Cortec® at Most Influential Oil and Gas Industry Event: Cortec Middle East to Present Latest Corrosion Protection Technology at the Abu Dhabi International Petroleum Exhibition! 09/27/17 - Cortec® R&D Creates Superior Reformulation of VpCI®-340 CLP with Extremely Low Freezing Point! 09/22/17 - Cortec® Coated Products Introduces EcoWeave - New High Tech Extrusion Coating Line! 09/01/17 - Cortec® Releases Non-Toxic Corrosion Inhibiting Graffiti Remover in a Recyclable EcoAir® Spray Can! 08/09/17 - Premium High Tech Cortec® VpCI® Papers Now Custom Converted in Croatia! 08/03/17 - Biodegradable Scale and Rust Remover from Cortec® Contains 100% USDA Certified Biobased Content! 07/25/17 - Cortec's New "VpCI® Additives for Cleaners and Degreasers" Brochure - Uniting Corrosion Protection with Cleaning! 07/18/17 - EcoCortec® - Leading European VpCI®/VCI Plastic Films Producer Receives a Certificate of Credit Rating Excellence! 07/13/17 - Cortec's Innovative Flexible Packaging Solutions: Protect Against Corrosion - Protecting Your Assets and Profits! 07/05/17 - Research Paper on Biobased Anti-Corrosion Coatings To Be Presented at EuroCorr 2017 by Cortec® Corporation! 06/28/17 - Custom-Made CorrTainer® powered by Nano VpCI® Boxes on Demand Produced in ANY Quantity at Cortec® Coated Products in Eau Claire, Wisconsin! 06/23/17 - New VpCI® Additives Brochure Presents Exciting AntiCorrosion Options for Coating and Paint Formulators! 06/02/17 - EcoCortec® Launches First European VpCI® Plastics Recycling Project! 05/16/17 - Cortec's Daughter Company Announces New Brochure: High-Tech Integrated Solutions for Corrosion Protection! 05/12/17 - World's Largest VpCI® Film Extrusion Plant Plans Important Expansion of Facilities and Cutting Edge Recycling Program! 05/08/17 - Latest Migratory Inhibitor Technology- Powerful Corrosion Protection of Post-Tensioned Structures! 05/04/17 - Cortec's New VpCI® Additives Brochure Offers Comprehensive Range of Corrosion Inhibiting Options! 04/27/17 - Breakthrough in Temporary Rust Preventive Technology: EcoCorr™ Water-Based RP Offers Excellent Performance and 40 Percent Savings Against Bestselling Petroleum-Derived RP! 04/20/17 - Cortec® Expands Capabilities and Efficiency with On-Demand Box-Making Machine! 04/03/17 - New Economical Environmentally Safe Corrosion Inhibitor For Multiple Applications! 03/29/17 - Cortec's New MCI® Technology Brochure Tackles Age-Old Problem of Infrastructure Deterioration! 03/21/17 - Cortec's New EcoAir® Mold Release Helps Protect Injection Molds, Castings, and the Environment! 03/15/17 - Cortec® Corporation Celebrates 40 Years of Fighting Corrosion! 03/03/17 - Cortec® Develops Specialized Ready-to-Use Rust Preventative Ideal for Tight Tolerances! 02/22/17 - Cortec® Celebrates 20 Years of Revolutionizing the Corrosion Inhibiting Industry at Cortec® Advanced Films! 02/08/17 - Cortec® Corporation Certified to Test Vapor phase Corrosion Inhibiting Ability of Hydraulic Fluids! 02/01/17 - Cortec® Designs Corrosion Inhibiting Additive Compatible with Diesel Fuel Tanks and Systems! 01/25/17 - High-Tech Protector for Electrical and Electronic Devices Saves Money and Combats Corrosion! 01/17/17 - Cortec's EcoShield® Heat Sealable Paper Offers Flexible Custom Recyclable Packaging Solutions! 01/13/17 - Cortec® Corporation Awarded 63rd Patent in 40 Years of Business! 01/09/17 - Cortec® Adds Extra VpCI® Protection to Time-Proven Corrosion Inhibiting Coating! 12/29/16 - MCI® Technology Preserving War - Destructed Monument and Symbol of Croatian Independence! 12/29/16 - New Brochure from Bionetix® International Presents Environmentally Friendly Private Label Options! 12/16/16 - Bionetix® International Provides Natural Solutions to the Growing Aquaculture Industry! 12/08/16 - Revolutionary USDA Certified Biobased and Biodegradable System for Metalworking Industries Coming from Croatia! 11/23/16 - Bionetix® All-Natural Plant Bio-Stimulant and Soil Microbial Enhancer Has Potential to Boost Crop Health! 11/15/16 - CorroLogic®: A Logical Solution to Soil-Side Corrosion Challenges on Aboveground Storage Tanks! 11/03/16 - Cortec's Exceptional, Environmentally Friendly Pipeline Casing Filler Product is Now Patented! 10/20/16 - Protect Sensitive Devices from Moisture, Mold, Mildew, and Corrosion with Cortec® Desicorr® Pouches NW! 10/03/16 - Save Time and Money with Cortec's EcoClean® Biodegradable Scale and Rust Remover powered by Nano VpCI®! 09/23/16 - Bionetix® Biosurf Uses Nature to Clean Oil Spills on its Own Surf and Turf! 09/15/16 - EcoAir® VpCI®-337 Offers Convenient, Environmentally Friendly Corrosion Protection in Recyclable Cans! 09/09/16 - Bionetix® ENZA 4EL: Improve Cleaning Speed and Efficiency With Natural Enzyme Power! 09/01/16 - New Biotechnology Campus Brochure Showcases Cortec's Strong Commitment to Discovering Natural, Environmentally Friendly Solutions! 08/22/16 - Cortec's CorShield® VpCI®-146 Reinforced Paper: The Toughest Protective Packaging Paper For Sharp or Oddly Shaped Metals! 08/03/16 - Bionetix&REG; ENZA 4EP: Superior Multi-Purpose Cleaning, Waste Treatment, and Remediation with Enzymes! 07/29/16 - Cortec's Migrating Corrosion Inhibitors Create Longer Service Life for Existing Overpasses and Bridges! 07/18/16 - Cortec's State of the Art EcoSol® Film Brings Added Quality to Bionetix's Natural Bioremediation Products! 07/12/16 - Best Selling Anti-Corrosion Film Globally Celebrating 25th Anniversary! 07/04/16 - Cortec® Forever Changes the Anticorrosion Coating Business! EcoShield®386 is the First Water Based Coating Ever with Salt Spray Resistance of Over 1,000 Hours in ASTM B117 Test! 06/24/16 - World's Largest Producer of Anticorrosion Packaging Announces its Latest Breakthrough Product: EcoShield® Nitrite Free Film powered by Nano-VpCI™, Patent Pending! 06/15/16 - Cortec® - World's Fastest Growing Manufacturer of Corrosion inhibitors! 06/08/16 - Reach New Heights of Corrosion Control with Cortec's "VpCI® Technology for Aircraft, Aviation, and Aerospace Industries"! 05/19/16 - Cortec® CorrLube™ VpCI® Lithium EP Grease: Longer Lasting Lubricant Offers Corrosion Protection on Electrical Connections! 05/06/16 - Cortec's VpCI®-371 Coating: Innovative Corrosion Protection That Reduces Manufacturing Costs! 05/06/16 - Cortec® Presents Record Number of Technical Papers at EuroCorr 2016! 04/28/16 - Safe Corrosion Inhibitor for Food Can Protection, Strong on Corrosion - Super Gentle on Food! 04/21/16 - Fight The Flames With Cortec's VpCI®-126 Flame Retardant Film! 04/15/16 - Spare a Thought for Critical Spares: Cortec® Offers Innovative Solutions to Global Companies! 04/08/16 - Cortec's "VpCI® Technology For Transportation and Municipalities" - Sustaining The Heartbeat Of Your City! 03/30/16 - Cortec's New Brochure: "VpCI® Technology for Food, Beverage, and Pharmaceutical Industries" - Amazing Technology For Industries That Sustain The World! 03/24/16 - Cortec's MCI® HPRS® Produces Amazing Results And Sharply Lowers Corrosion Rates In Concrete! 03/17/16 - Cortec's CorShield® VpCI®-148 Oil And Grease Resistant Paper Powered By Nano-VpCI™ Solves Corrosion Problem Of Leading German SUV Manufacturer! 03/11/16 - Cortec® Corporation Conducts Preservation Project on Saadiyat Island! 03/03/16 - Cushion and Protect with Cortec's New Cor-Pak® Dunnage Bags Powered by Nano VpCI™, Patent Pending! 02/17/16 - BioCorr® Receives EU Trademark Approval, Strong on Corrosion - Gentle on Nature - Easy on the Wallet! 02/09/16 - ABC Concentrates - Missing Link Between Environmental Protection and Effective Treatment! 01/27/16 - Three Cortec® MCI&REG; Products Mitigate Ongoing Corrosion! 01/21/16 - Cortec® Presents New MCI® Admixtures Brochure: Simple, Sure, Safe Technology For Extending Concrete Service Life! 01/21/16 - "Peel" Off Your Corrosion Problems with MCI® Peel-Off Coating! 01/13/16 - Cortec® Announces New Video Visualizing Nano VpCI® Coatings Technology! 01/01/16 - Stripping Has Never Been Easier - Use Cortec's New VpCI®-372 Temporary Coating! 12/23/15 - Cortec® Presents New Brochure - VpCI® Technology for Chemical Processing Industry! 12/18/15 - Cortec® Unveils New Website for Micro-Corrosion Inhibiting Coatings™ Powered by Nano VpCI®! 11/30/15 - Cortec's VpCI®-329 D Now Available In Easy Spray Formula - Convenient Corrosion Protection For Your Assets! 11/23/15 - Cortec® Helps Aging Oil And Gas Structures In The Middle East Get A New Lease On Life! 11/11/15 - Cortec® Publishes New Brochure Highlighting Micro-Corrosion Inhibiting Coatings™ Powered By Nano VpCI®! 10/30/15 - Cortec's Cor-Pak® VpCI® Static Dissipative Bubbles Powered By Nano-VpCI®: Smart Solution For Your Packaging Needs! 10/22/15 - Cortec's CorShield® VpCI®-649: Environmentally Safe Solution For Heating And Cooling Systems! 10/15/15 - Remove Rust Inexpensively, Effectively and Safely While Adding Corrosion Protection! 10/09/15 - Cortec's New VpCI®-280: Fast Drying Topcoat You Won't Have To Wait For! 09/14/15 - Cortec's New "VpCI® Technology for Off-Road Equipment and Mining Industries" Brochure Now Available! 09/10/15 - Cortec's MCI® Coating for Rebar - Superior Corrosion Resistance for Reinforcing Metal! 09/03/15 - Cortec's Commitment to Quality, Excellence, and Leadership Shine Through With ISO/IED 17025, ISO 9001:2008, and ISO 14001:2004 Recertifications! 08/24/15 - Cortec® Presents New Brochure - VpCI® Technology No. 1 choice for Marine and Shipbuilding Industries! 08/21/15 - EcoFog® VpCI®-309 Nano: Corrosion Protection For Hard to Reach Areas! 08/14/15 - CorShield® VpCI® -146 Creped Paper: Packaging For Multi-Metal Corrosion Protection! 07/30/15 - EcoSol® Water Soluble Film Technology - Newest Generation of Packaging Solutions! 07/23/15 - Bionetix® Bioaugmentation Products: Preparing The Industry For Season Changes! 07/16/15 - Cortec's VpCI®-391: A Non-Tacky Water-Borne Coating For Long Term Protection! 07/10/15 - Bioremediation Product Successfully Used for Environmentally Safe Treatment of Refinery and Chemical Waste! 07/01/15 - Cortec's New Brochure "VpCI® Technology for Oil and Gas Industry" Now Available! 06/24/15 - CorShield® S-69 - Powered by Nano VpCI® - Environmentally Sound and Cost Effective Solution for Water Treatment Industries! 06/11/15 - Multiple Benefits From All Natural Feed Additive for Aquaculture Industry! 06/05/15 - Cortec's New "Smart Packaging Powered by Nano-VpCI®" Brochure Is Now Available! 05/29/15 - Cortec® Announces VpCI®-643: Environmentally Safe Corrosion Solution For Process Applications! 05/19/15 - CorShield® VpCI 146 - Environmentally Safe and Economical Replacement for Toxic Nitrite Coated/Impregnated Papers! 05/15/15 - Cortec's BioCorr® ATF Rust Preventative: Biodegradable, Biobased, and Sustainable Corrosion Protection for the Automotive Industry! 05/06/15 - Cortec's New Automotive Brochure Now Available! 04/21/15 - Cortec® Middle East Gears Up To Support Drilling Companies For Rig Stacking! 04/14/15 - New Micronutrient Blend for Superior Soil and Wastewater Bioremediation! 04/09/15 - Cortec® Announces ISO 9001 Recertification Completed With NO Non-Conformances - Proving Quality And Excellence Are The Number One Priority! 04/02/15 - Latest State Of The Art Packaging Solution: High-Tech Corrosion Protection from Aggressive Environments and UV Exposure! 03/24/15 - Cortec® Introduces VpCI®-386 HT Black: High Heat Resistant Coating Solution For Any Application! 03/18/15 - CorrShield VpCI®-379 - Tough on Corrosion Easy On Your Wallet! 02/17/15 - CorrBlock™ - Slow Release VpCI® Containing Block Top-Notch Corrosion Protection in Cooling and Waste Water Systems! 02/13/15 - Cortec® Recertified For ISO 14001:2004 - Continuing Dedication To Excellence! 12/31/14 - PRESS RELEASE: Cortec® Presents VpCI® -406: Protecting Your Vehicle This And Every Winter! 12/05/14 - Latest Export Packaging Advancement from EcoCortec® d.o.o. Croatia Custom Fabricated Equipment Covers and Hoods Powered by Nano-VpCI®! 12/04/14 - Cortec® Presents EcoClean® VpCI®-434G & VpCI®-434L Eco-Friendly Paint, Graffiti, and Gasket Removers! 11/20/14 - Boost Engine Power and Cut Repair Costs With VpCI&REG;-705 Bio Fuel Additive Powered by Nano VpCI&REG;! 11/13/14 - Cortec's New VpCI® Additives Brochure Now Available! 10/30/14 - Bionetix ® ECP 57 - Enzyme Blend for Complex Grains and Woody Material Breakdown! 10/24/14 - The World's Largest VCI/VpCI® Plant Just Got Larger - Faster - Better! 10/15/14 - Europe's Biggest VCI/VpCI® Plant Just Got Bigger! 10/14/14 - Cortec® Corporation's "Corrosion Inhibiting Vapor For Use In Connection With Encased Articles" US Patent Number 8,800,224 Was Published August 12th, 2014! 09/30/14 - BioPouch™ Powered by a NANO-VpCI®-Latest Breakthrough in Corrosion Protection Technology! 09/26/14 - Preservation For The New Millennium - Cortec® VpCI®-126 Blue and VpCI®-386! 09/16/14 - Find Out What Multi-Purpose Really Means With Cortec®'s EcoClean® VpCI®- 411 Cleaner/ Degreaser! 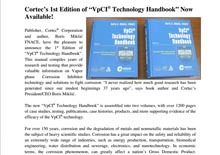 09/13/14 - Cortec's 1st Edition of "VpCI® Technology Handbook" Now Available! 09/04/14 - MCI® Creteskin® - Best Equipment Protection For Reduced Cost! 08/26/14 - Improving Sustainability, Quality, and Carbon Foot Print at Cortec® Advanced Films in Cambridge, Minnesota! 08/25/14 - Cortec® Corporation Only Laboratory in VCI Industry ISO/IEC 17025 Accredited! 08/18/14 - Cortec's "Bio-Based Corrosion Inhibitors" US Patent Number 8,795,589 Published August 5, 2014! 07/30/14 - Reduce Your Processing Costs and Increase the Time of Remediation! 07/25/14 - Cortec&REG; M-141, Cohesive Strength in Your Hands! 07/14/14 - New EcoShield® Environmentally Friendly Moisture Barrier Paper - Complete Replacement for PE and Wax Coated Papers! 07/01/14 - Cortec's M-528: Provides Corrosion Protection In Harsh Subsea Environments! 06/24/14 - EcoCortec®'s Success in Marine Clean Project! 06/20/14 - Cortec's 1st Edition of "Improving Durability of Infrastructure with Migratory Corrosion Inhibitors (MCI®) Handbook" Now Available! 06/06/14 - Cortec® MilCorr®: Stronger Than Mother Nature! 05/29/14 - Cortec® Corporation Celebrates 20 Years Of ISO 9001 Certification! 05/16/14 - Cortec® Leaps Into The Future With The Addition Of Cortec® Biotechnology Campus In Florida! 05/09/14 - Cortec® MCI®-2005 Used In Al Jalila Pediatric Care Hospital Project! 04/25/14 - Cortec® Introduces CorShield™ VpCI®-386 HP powered by Nano-VpCI®: The Next Generation Of High Performance Coatings! 03/28/14 - Bionetix® All Purpose Odor Eliminator - Clears The Stink Faster Than You Think! 03/21/14 - Restoration of Ferrari/Pininfarina legend using VPCI- NANO® Technology (Vapor phase Corrosion Inhibitor)! 03/14/14 - Cortec® VpCI®-143 Paper Emitters: More Convenient Packaging Solution! 03/10/14 - Cortec® M-531 T: Oil-Based Additive Package Of Ash Free Corrosion Inhibitor! 02/27/14 - Cortec® EcoLine® Cutting Fluid Withstands Bitter Cold! 02/21/14 - Cortec's New MCI®-2012 IntegraPel: Prevents Corrosion Of Steel Reinforcement In New Structures! 02/10/14 - Superior Multi-Metal Corrosion Protection in Any Enclosure! 01/20/14 - Bacto-Control - Newest Method for Rational and Safe Crop Management! 01/07/14 - Cortec® VpCI® Coatings Outperformed Competition in NASA Research Project! 01/07/14 - Cortec® New Shrink Films Brochure Now Available! 12/24/13 - Congratulations Cortec® Lab for ISO/IEC 17025:2005 Recertification! 12/17/13 - Corrosorber® Paper - Tarnish Inhibiting Packaging Powered by Nano-VpCI®! 12/05/13 - Biopad®-Biobased Fabric Powered By Nano-VpCI®For Corrosion And Surface Protection Of Multi-Metals! 11/27/13 - Congratulations Boris Miksic, Member #157330, on forty years of membership with NACE! 11/22/13 - Revolutionary Technology to Extend Concrete Durability! 10/24/13 - Latest Technology for Biological Waste Treatment Bionetix International - Presents its New Improved Product Lines! 10/03/13 - Don't Squeal About Corrosion Issues - Use Cortec's CorroLogic Systems VpCI-639 & VpCI-639 HFB For Hydro Testing And Pigging Of Pipelines! 09/27/13 - Premium Corrosion Protection Paper in the Industry- Safe, Economical and Super-Effective! 09/18/13 - Cortec's ElectriCorr VpCI-286 Conformal Coating: The Smartest Choice For Your Electronics! 09/06/13 - Expansion of EcoCortec Plant! 08/22/13 - VpCI-132 Foam Pad - Global Industry Standard for Export Packaging! 08/15/13 - Cortec's 3rd Edition Of The Preservation, Lay-Up, & Mothballing Handbook Now Available! 08/08/13 - Have a Corrosion Headache?...Take a Pill! 08/01/13 - Cortec Announces VpCI-328 - Excellent Lubrication and Corrosion Protection In One! 07/25/13 - Bionetix International Announces BCP 85 For Acceleration and Optimization Of Compost Degradation! 07/18/13 - Cortec Announces VpCI-398 Undercoat Powered by Nano-VpCI Your Vehicles Should Never Rust Out! 07/03/13 - Historic Zagreb Cathedral Restored with Cortec! 06/27/13 - Bionetix International Announces Its New Fire Damage Deodorizer! 06/17/13 - Restoration of Drilling Tools Utilizing Environmentally Safe and Super Effective VpCI Technology! 05/28/13 - Cortec's "Anti-Corrosive Corn Extracts" US Patent Number 8,440,095 Awarded May 14, 2013! 05/22/13 - Bionetix Bio-Tab 1T: Enhance Water Biology in Septic Systems! 05/16/13 - Revolutionary System for Top of the Line Corrosion Protection of Pipelines! 05/09/13 - Enhanced Solution for Surface Preparation of Multiple Metals! 04/25/13 - Cortec Announces M-533 FG Anti-Corrosion Additive For Food Grade Lubricants! 04/18/13 - Cortec's MCI-2019 Sealer Latest Technology for The Preservation of Concrete Structures! 04/11/13 - Cortec's "Bio-Based Corrosion Inhibitors" US Patent Number 8,409,340 Was Published April 2, 2013! 04/03/13 - CorroLogic™, The Blueprint of Cortec CEFS Custom Engineered Corrosion Solutions! 03/28/13 - Non-Toxic Cooling System Toads Against Global Warming! 03/20/13 - Cortec Cor-Pak VpCI Stretch Film Keeps Unruly Shipments Under Wraps! 03/19/13 - Cortec Receives The Materials Performance Reader's Choice Innovation of the Year Award! 03/07/13 - BioWrap powered by Nano-VpCI - The Latest High-Tech Packaging Solution! 02/27/13 - CorShield VpCI Transit Coating - Superior, Environmentally Safe Replacement for Hazardous Corrosion Preventives! 02/20/13 - Cortec Introduces Cortec Biotechnology - Creating New Bio-Economic Opportunities! 01/31/13 - Solve Your Protective Coating Problems With Cortec's VpCI-390! 01/09/13 - Cortec's VpCI-426, Formulated Three Ways To Clean, Protect, & Preserve! 01/04/13 - Cortec's CorrVerter® - Two Custom Colors Now Available! 12/13/12 - MTBE Manufacturing Plant in Dubai Preserved in Record Time! 11/16/12 - World Renowned Severn Bridge Preserved with Patented PTC Emitters! 10/24/12 - The Only Right Choice for Surface Preparation! 10/11/12 - Cortec® Corporation Completes Phase VI Expansion To The World's Largest VpCI®/MCI® Synthesis Plant! 10/03/12 - Let The Light Shine Through With Cortec's MCI® Window Protector! 09/06/12 - Cortec's Eco Tire Duragloss: High Gloss Shine Without Solvent Or VOCs! 08/30/12 - Cortec's VpCI®-428: Powerful Punch Against Aluminum Oxides and More! 08/16/12 - Cortec's EcoLine® 3220 Assigned NSN By Defense Logistic Agency! 08/02/12 - Remove Rust, Scale, And Tough Concrete Residue With Cortec MCI Super Remover! 07/26/12 - Cortec EcoWorks® AD: Biobased Film That's Environmentally Friendly From Beginning To End. 07/12/12 - Biobased Rust Preventative for Precision Machined Metallic Surfaces! 06/19/12 - Micro-Corrosion Inhibiting Coating! 06/13/12 - Cortec's Organic, Biodegradable VpCI-422 Rust Remover: Free of VOCs, Solvents, & Phosphates. 03/27/12 - Cortec Corporation Presents MCI CorteCure®, A Biobased Concrete Curing Compound Boasting Superior Corrosion Protection. 01/26/12 - Environmental Breakthrough with Cortec's EcoAir® Product Line! 01/19/12 - Cortec Corporation Wins Small Business Success Story Award from Twin Cities Business Magazine. 12/16/11 - VpCI-337 - Quick and Easy Corrosion Protection! 12/01/11 - Cortec Corporation Announces VpCI-126 TRF: An Anti-Corrosive Film That Stands Up To The Heat Of Industrial Work. 09/29/11 - Cortec's EcoLine® Coatings- Green Replacement for Toxic Mineral Oils! 08/24/11 - Cortec VpCI-380: Weatherproofing for the Long Haul! 07/25/11 - Cortec MCI-2018 V/O; Creating a Strong Bond for Corrosion Protection! 07/20/11 - Cortec's S-7 Liquid for Rapid Oxygen Removal! 07/12/11 - New Revolutionary Green Film for Industrial Packaging! 06/09/11 - Cortec's EcoLine® CLP, The Green Way To Protect Machinery Parts From Friction And Corrosion. 05/26/11 - New From Cortec : CorroLogic™ VpCI Filler Seals Interstitial Spaces and Provides Long-Term Control of Corrosion. 05/19/11 - Cortec MCI POWR: Extends the Life of Reinforced Concrete Structures. 05/05/11 - Cortec M-531 Provides Protection Like No Other! 04/11/11 - Revolutionary Wipes Remove Rust, Oil and Dust! 02/16/11 - Cortec Unveils New and Improved MCI Website! 10/10/10 - Go Greener with Cortec EcoAir® for FREE! 09/20/10 - Cortec Corporation named a finalist for 11th annual Tekne Awards! 08/05/10 - MCI Wall Defense is tough enough to face Mother Nature and vandals. 07/16/10 - Cortec announces EcoEarth™ product line, EcoEmitter®, and a glimpse of the future in corrosion protection. 06/08/10 - Cortec EcoPrimer: A Bio-Based Solution to Corrosion. 05/20/10 - Cortec HC products for drinking water pipeline applications. 05/12/10 - Cortec Eco Works® Bags comply with new state law. 04/21/10 - The Wisconsin Department of Natural Resources has qualified Cortec Spray Technologies Wisconsin Green Tier Program. 04/08/10 - Cortec's New FlashCorr VpCI removes salt build-up while protecting from corrosion. 03/25/10 - Cortec's New Corrosorber® Liquid: Non-hazardous gas treating scavenger. 12/15/09 - Cortec Launches Corrosion Engineering and Field Services Worldwide. 10/27/09 - Cortec's EcoWorks Resin now available for your film production needs. 06/04/09 - Cortec's BioPad® Offers Two Times More Protection Than Other Packaging! 05/12/09 - Cortec's Free Mothballing Manual: A concise guide of proven solutions to protect assets. 03/04/09 - Cortec's Desicorr® and Desicorr® VpCI Pouches: Larger Sizes For More Protection. 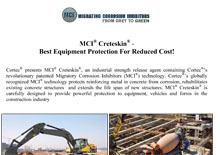 02/11/09 - Reduce Your Costs and Protect Your Equipment with Cortec's MCI Creteskin™. 01/16/09 - Cortec's Cor-Pak® VpCI Masking Film Wont Leave You Sticky. 12/22/08 - Cortec's CorrTainer named packaging of the year. 12/16/08 - Cortec's Mothballing Manual: A concise guide to proven solutions. 09/16/08 - Struggling with scale formation? Take control with Cortec! 09/15/08 - Cortec announced as finalist for ninth annual Tekne Awards! 09/05/08 - Cortec primer provides long-term protection in a corrosive atmosphere. 07/21/08 - Cortec sealer protects 31 year old bridge! 07/03/08 - EcoLine provides historical bridge with needed protection in Hawaii! 06/06/08 - Unbeatable Corrosion Protection While Protecting the Planet! 04/25/08 - A Crucial Green Building Block for Cooling Systems! 02/22/08 - Cortec Creates Innovative Earth-Friendly Product! 01/18/08 - Eco Wrap Biodegradable Film Crosses the Ocean!